Can I just say, I love this show? I think it has one of the finest ensemble casts of all time. I started watching when it premiered back when I was in my first year of grad school. I remember calling my college roommate, Mary, and saying something to the effect of "Did you see this? Wasn't it amazing?" Mary and I had similar taste in tv (we never missed the x-files). 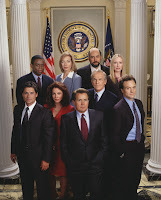 She and I came to the same verdict - Aaron Sorkin was a genius. I have since rediscovered the show since over the holidays, Best Buy had all seasons of the show on DVD for $15 each. I bought seasons 1-5. Since I had no cable tv at the time, its all I watched. My brother, at my request, got me seasons 6 and 7 for Christmas. I am almost done with season 7 and feel like I could start back at 1 and watch all over again. The pace is fast, the acting (as evidenced by the many Emmys it won) was amazing, and the story-telling was fictionalized but completely plausible. One of the best episodes was the "live" debate between the two presidential nominees. It was performed live - once for the east coast and once for the west. The ability to do this speaks volumes of the talents of the writers, not to mention the acting skills of Jimmy Smits and Alan Alda. This may be my favorite tv show of all time. If you haven't seen it, I highly recommend it.